Norco Ranch Outfitters has been supplying horse and rider for over 30 years. Carrying the top brands of saddles, tack, clothing, boots, helmets; and offering free saddle fitting and a full line of farrier supplies (with the NRO Farrier Club), Norco Ranch has become the one stop shop for your equestrian needs. Recently remodeled and merchandised to help shoppers flow through the store more easily to find what they are looking for, NRO staff is at hand to give you the complete shopping experience. Be sure to save the date for their Annual Parking Lot Tack Swap Meet on Sunday, May 1st. This is the time to clean out the tack room and sell those pieces you just don’t use any longer. Be sure to stop by during Norco Horseweek and say hello. You never know who or what will be in store. The Valley Center Vaqueros hosted its Second Annual “Day of the Horse” on Feb. 7, featuring a wide range of activities for horse-lovers.Created to be a fun educational opportunity for the community, the event included vendors, drill team performances, and demonstrations of reining, mounted shooting, driving, vaulting, jumping, polo, dressage and more. “We began the Day of the Horse to be a venue for all equestrians to learn,” said Vaqueros President Deanne Sanderson. Since its early days as a Spanish rancho, horses have been part of this North San Diego County town’s fabric. They still are — in exciting new ways. SAN MARCOS — Times are challenging for horse people in desireable places with natural beauty, accessiblity and a perfect climate. Competition for land and local government attention can be brutal as population increases while available property does not. 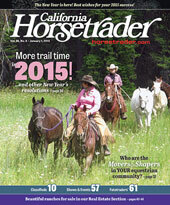 Some California horsetowns are seeing a reduction in equine activities, and even less people owning horses within the community. 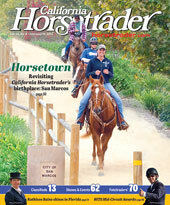 But in the San Diego County town of San Marcos, horses still reign supreme. One reason for San Marcos stability as a horse community is the dedication of horse people within the Twin Oaks Valley, the northernmost section of town. Equestrian properties line the nearly 10-mile long Twin Oaks Valley Road, and are thriving. 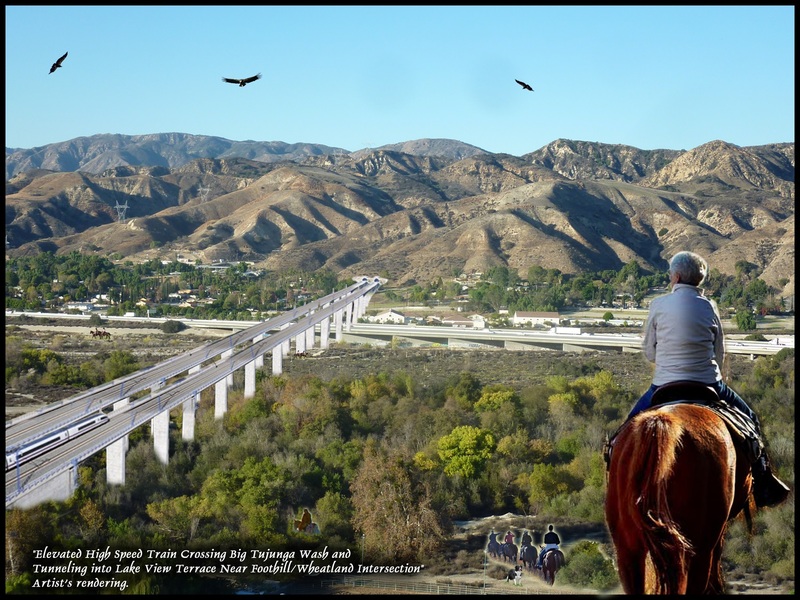 Artist rendering of High Speed Rail crossing Big Tujunga Wash and proposed tunnel in Lake View Terrace. Horsepeople in Lake View Terrace and surrounding areas have a few words for the State High Speed Rail Authority about a new proposed path for the futuristic 220-mph bullet train through their community: Not so fast. Three alternative routes surfaced in December after an original plan for the leg from Palmdale to the Burbank airport, a 51-mile stretch along the Highway 14 corridor, was criticized by residents and officials. Called the East Corridor, the newest trio of alternative routes cuts through Lake View Terrace and would impact horse ownership throughout the San Fernando Valley. 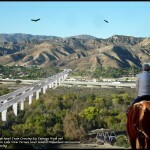 Further, the redirection of the Highway 14 route would require a 35-mile tunneling beneath the San Gabriel Mountains and the Angeles National Forest, with the bullet train screaming from a tunnel and over the Tujunga Wash, an equestrian paradise. Who are the Movers & Shapers of your horse community? When Lynn Brown first took to the Griffith trails on horseback, the daughter of a Texas rancher saw a piece of half-buried steel rebar sticking up from the path, and she called the City of Los Angeles. They fixed it. Twenty years later, Brown remains vigilant – and effective. Her view has expanded beyond her beloved local trails, as she now is Vice President of the Los Angeles Equine Advisory Committee, an official City advisory body she helped launch in 2009 that reports directly to the 15 L.A. council members. Entering its seventh year, the EAC has an impressive achievement list on behalf of equestrians, from protecting vast city horse trails to fending off extreme activists attempting end-runs to squelch horse ownership. Tireless campaigns by Brown and her colleagues have provided insights, none greater than the importance of positive community involvement. EASTERN SAN DIEGO COUNTY – In the not-too-distant past, Eastern San Diego County was mostly grazing land for cattle, dotted with small farm towns. Today, this part of the county is a growing bedroom community, only 15 miles from downtown San Diego. Yet despite its significant growth over the last 50 years, Eastern San Diego still holds on to its agricultural roots. The evidence? Horses are still a big part of life here. Los Angeles City Hall was filled with horsepeople of all shapes and sizes Oct. 22 as the Day of the Horse was brought to council. LOS ANGELES – More than 100 equestians from 17 of this city’s diverse associations converged on City Hall Oct. 22 to commemorate the Official L.A. Day of the Horse. Tom LaBonge, Councilman Fourth District, was front-center of the ceremonies, which also featured words from Los Angeles Equine Advisory Council President Dale Gibson and Vice President Lynn Brown. La Bonge patiently took time to thank and be photographed with each group, including the likes of the Equestrian Trails, Inc. Junior Ambassadors and ETI Corral 20, the Enterprise Farms U.S. Pony Club Riding Center, the Interscholastic Equestrian League, the L.A. Equestrian Vaulting Club and others. Brown, a longtime equestrian advocate in her hometown who has urged equestrian groups to reach out to local city councils for a rapport with bureaucrats and horse people, was thrilled to see the turn-out of young riders. LAKE VIEW TERRACE — If you love California, you will appreciate Lake View Terrace. In the wintertime, the snow covered ridges of the San Gabriel Mountains stand as a backdrop. In the spring, wildflowers color the foothill slopes. On summer evenings, the smell of sage rises up from the creek beds. And in the fall, a crisp wind blows down from the hills. Vineyards and horses are part of Paso Robles past, present, and future. It was 1797 when Father Junipero Serra planted more than 1,000 grapevines in the pristine hills of California’s central coast. The vineyard, adjacent to one of the Central Coast’s most beautiful missions, San Miguel Arcangel, would eventually become part of a picturesque community rich in history, viticulture, and, of course, horses. Paso Robles, located in northern San Luis Obispo County, is home to 30,000 residents. Incorporated in 1889, the name Paso Robles comes from the Spanish El Paso de Robles, or “The Pass of the Oaks.” Situated 230 miles north of Los Angeles and 210 miles south of San Francisco, this 19.9-acre city is a haven for horse lovers. BONITA — Thanks to a campaign by members of a local riding group, a popular recreational trail near the Sweetwater Valley reservoir reopened June 25 after being closed for six months.